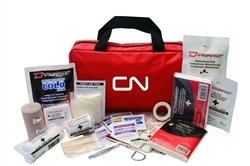 112 piece first aid kit in an easy to carry nylon bag. Includes: bandages, tweezers, latex gloves, instant cold compress, gauze, first aid instruction card and much more. Imprint CN logo.